Symbiosis Institute of Operations Management witnessed its annual flagship event – a series of four converges on the 18th and 19th of August 2018. 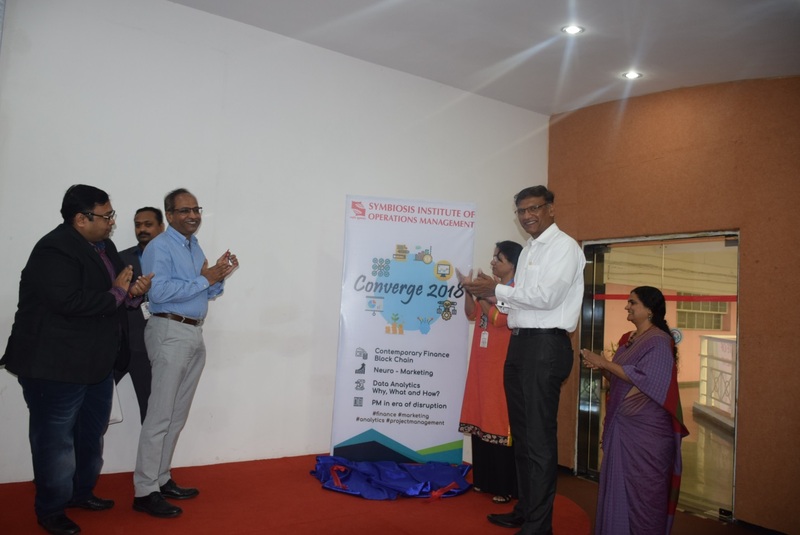 The Converges revolved around some of most popularly discussed topics in the fields of Marketing, Finance, Analytics and Project Management. 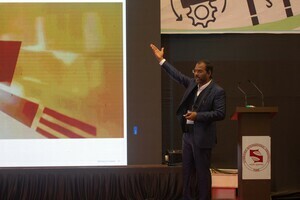 The event commenced with the Marketing Converge; with the main theme for the converge being ‘Neuromarketing’. The introduction to the event was delivered by Dr. Rajaram GovindRajan. The topics discussed were focused on the trend analysis in marketing, understanding a consumer’s behavior and how exactly to rightly target them. The list of keynote speakers included Mr. Ram Jalan (Head Marketing- The Wave Group) who delivered a speech on 'Neuromarketing in India and its implication in an e-commerce industry' and Mr. Rajesh Kurup (Managing Director- Millward Brown) who shared his insights on 'Neuroscience in marketing and how it’s used in advertisements'. Followed by the marketing converge, was the finance converge which focused on the topic ‘Blockchain’. The sessions saw some real enthusiasts in the field of finance. The keynote speakers at this converge were Mr. KashinathKatakdhond, M.D., MonetaGo India, Mr. Nisarg Shah, Blockchain and IoT Expert, Sabstone, Mr. BaibhavAnand, Senior Product Manager at Oracle and Mr. Satish Salivati. They spoke about the future of finance, and about how the world would remain connected through block chain and crypto-currencies. The second day began with the Analytics converge focusing mainly on ‘Data analytics- Why, When and How?’ The sessions were driven by Mr. AashishKhilari, Vice President, Internal Audit, Morgan Stanley accompanied by Mr. Nikhil Khuranna, Internal Audit, Morgan Stanley. The discussions focused on a brief introduction to data analytics explaining how it’s used in the industry for fraud management and audit, and also on the generic data cycle in the industry. 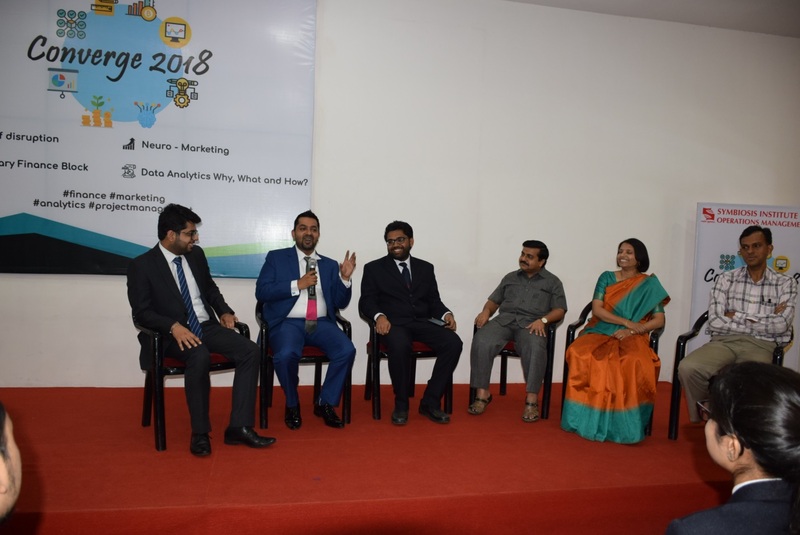 The session ended with a panel discussion where we had some of our expert faculties in Analytics sharing the stage discussing on the industry perspective of data analytics. This was followed by the final converge on project management whose theme was ‘Project Management in the Era of Disruption’. 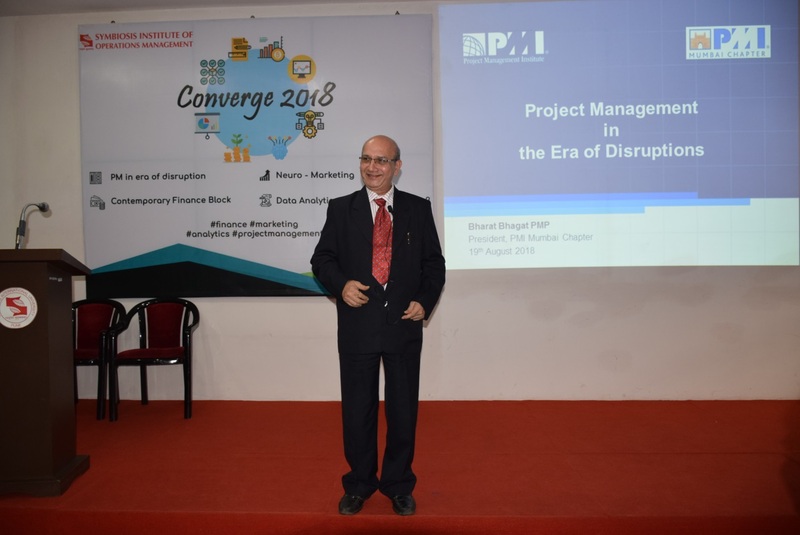 We had some great speakers at this converge consisting of Mr. Bharat Bhagat (Honorary President, Project Management Institute, Mumbai Chapter) who covered the topic - ''Project Management in the Era of Disruption'', Mr. Kiran Rajeshirke (Enterprise Agile Transformation Consultant/ Agile Coach/ PMI - India Champion, Teradata) who shared his insights on the topic - ''Agile Transformation & Leadership'' followed by a panel discussion on the topic – "Digital Project Management Comes of Age". Our Panelists included Mr. Bharat Bhagat, Mr. Kiran Rajeshirke, Mr. DY Pathak (Senior Professional in Portfolio/ Program / Project Management, BFSI and IT) and Mr. Rajesh Deshmukh (Business Head - SM Auto Stamping Pvt. Ltd.) The two-day event helped the students get a deep insight from some of the industry stalwarts thereby exposing them to new and current ideas and perspectives and hence providing a platform for a great learning experience.